Capri Insurance’s Tim Miller, left, Heat volleyball player Jim Bell (2012 Capri Scholarship winner), Heat soccer player Devon Fleming-Frame, and Capri Insurance senior partner Robin Durrant, celebrate Capri’s continued support for UBC Heat athletes. Devon Fleming-Frame is a team player. And as a keen mid-fielder with UBC Okanagan Heat women’s soccer team, she knows her fellow teammates have her back. But she also knows she wouldn’t be where she is today without the generosity and support from Capri Insurance. Fleming-Frame is the recipient of this year’s Capri Insurance Athletics Entrance Scholarship. The scholarship is an endowed award donated by Capri Insurance for a UBC Okanagan varsity player coming straight from secondary school. Candidates must demonstrate stellar athletic achievement and academic excellence. As the scholarship winner, Fleming-Frame will receive $2,500 each year, up to $10,000, while she maintains her status on the varsity team and continues her high academic scores. A graduate of Burnaby’s Moscrop Secondary School, she is currently enrolled in the Irving K. Barber School of Arts and Sciences at UBC Okanagan. Director of Athletics and Recreation at UBC's Okanagan campus Rob Johnson credits Capri’s top managers Tim Miller and Robin Durrant for helping UBC attract and develop young, student athletes. The Heat women’s soccer team has a strong track record, earning provincial medals for four straight years. Last fall, the team won the bronze at the 2013 PACWEST provincial soccer championships, after back-to-back silver medals in previous years. It’s going to be a bit different next year, however, as six players are not returning, either because they are graduating, or completion of eligibility. 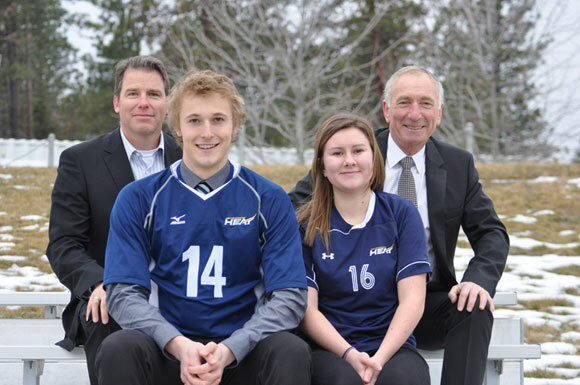 And both the men’s and the women’s soccer teams from UBC’s Okanagan campus will play the 2014 season in the Canada West conference of the Canadian Interuniversity Sport moving from the Canadian Collegiate Athletic Association. UBC is grateful for the support of Capri Insurance, says Johnson, noting that Capri’s contributions, along with many other donors to the university’s start an evolution campaign, have helped raise more than $71 million, much of it in direct support of students.